Blue’s Fence company would like to thank you for inquiring about our fence and giving us the opportunity to assist you in the first step towards purchasing a fence. Choosing a contractor is not always easy and there are several factors to consider when determining which company is offering you, the customer, the best value. Included are some tips, suggestions and information which we hope will be helpful to you in choosing not only a fence contractor, but contractors for other projects as well. Bids: A company’s reputation, workmanship and warranty should always be considered along with the price. Be wary if one price is significantly lower than the others. Try to determine why the price difference is so great. The state of Indiana requires contractors to have worker’s compensation, liability and property damage insurance. Worker’s compensation protects you if a worker injures himself on your property. Some contractors try to lower their price by not carrying insurance. This may place you at a legal risk, so make sure your contractor has all the necessary insurance. You may obtain a copy of our certificate of insurance by calling Bundy McNear Insurance at (765) 742-4031. References: Ask for references along with recent installation sites. Inspect them to get a sense of the contractor’s workmanship. Quality is important. At Blue’s, we only use proven installation methods, materials and hardware, and only purchase from reputable manufacturers and distributors. We have included a list of references and there is a high probability of having many of our fences in your neighborhood. Experience: How long has the contractor been in business? Have they been in business before under a similar name? Who serviced their fence when they were out of business? 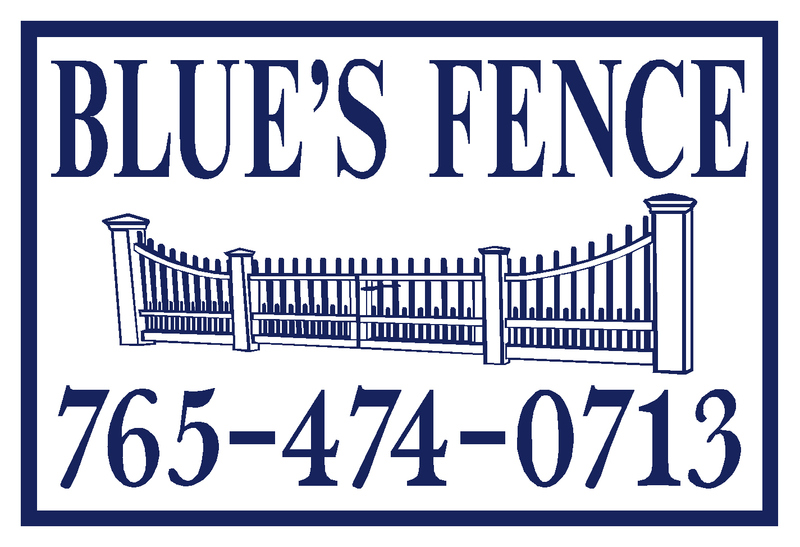 At Blue’s, we have been in business, continuously, using the name Blue’s Fence for 50 years and have offered continuous service to our customers. We do not employ subcontractors and our employees are professional, long time installers with several having over 20 years continued fence building experience, and many having 4-6 years experience. This is both a value to us and our customers! Warranty: Know up front, in writing, what the contractor’s warranty is. At Blue’s we warranty our workmanship for the life of the fence. Blue’s Fence service and commitment continues long after receiving your payment. If you call needing service we make every effort to be there as expediently as possible. Blue’s Fence would like the opportunity to assist you with your fencing needs. Regardless whom you choose to build your fence, our ultimate goal is that you, the buyer, are well informed and receive the best product, service and value.